University of the Philippines, Diliman, PHILIPPINES. Jubail University College – Male Branch, Jubail Industrial City, KINGDOM OF SAUDI ARABIA. State University of Malang, INDONESIA. Sultan Qaboos University, SULTANATE OF OMAN. AMA International University-Bahrain, KINGDOM OF BAHRAIN. Faculty of Economic and Business, Pancasila University, INDONESIA. Business School, University Of Shanghai for Science and Technology, Shanghai, CHINA. Department of Information Mangment, Lunghwa University of Science and Technology, Taiwan; National Tainan Junior College of Nursing, TAIWAN. Department of Business, Higher College of Technology, Women’s College, Al-Ain, UNITED ARAB EMIRATES. Rector of STIAMI - Institute of Social Sciences and Management, Cempaka Putih, Jakarta, INDONESIA. Muhammadiyah University of Prof. Dr. Hamka, DKI, Jakarta, INDONESIA. Note: Remaining papers will be uploaded soon. 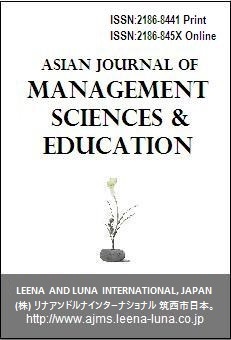 Asian Journal of Management Sciences & Education (AJMSE): April 2019 Issue, will be online on April 15, 2019. Asian Journal of Natural and Applied Sciences: March 2019 Issue, will be onlineafter March 15, 2019. © 2012-2016 (株) リナ＆ルナインターナショナル 玉戸, 筑西市, 日本. Leena and Luna International Co Ltd, Tamado, Chikusei-shi, Japan.